IT'S bound to be a very good Friday night’s entertainment as Downend Folk Club round off their Spring Programme over the Easter Weekend with a visit from a duo launching their first album in five years! The Askew Sisters have become known as two of the foremost performers and interpreters of English folk music. Their live performances brim with the depth and connection not only of two sisters, but also of two musicians who have been immersed in folk music all their lives. 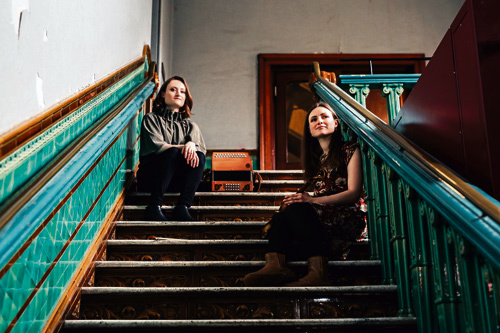 Emily and Hazel Askew rework and reinterpret songs and balladry, creating breath- taking arrangements, which allow words that are hundreds of years old to resonate profoundly with contemporary audiences. Alongside this, both women are also skilled multi-instrumentalists and expert players of dance music, using fiddles, melodeons, concertina and cello in their innate drive to bring old dance music to life. In 2014, their third album In the Air or the Earth was released to critical acclaim. Since then, the two women have been busy working on a number of other innovative projects; Emily has been touring with her vibrant fiddle band Alma, as well as releasing her first solo album, while Hazel has been busy working with her groundbreaking trio Lady Maisery, as well as folk super groups Coven and Songs of Separation. Stirred by these new musical experiences, the sisters now return to their duo with a fresh vision. They spent 2018 deep in rehearsal, reconstructing and re-exploring their sound, unearthing old songs, as well as composing and creating new music. The culmination of this will be their long awaited fourth studio album, Enclosure, which is released as part of this tour. Opening the evening’s entertainment will be Nick Hart, a folk singer deeply rooted in the English tradition. Raised in a family of morris dancers, Nick played instrumental music for many years before discovering his passion for traditional song. Whilst studying for an ethnomusicology degree, he began to explore the large body of recordings of traditional singers from the second half of the 20th century, and this led to several years of fevered study and many nights spent at folk clubs and festivals, honing his skills as an unaccompanied singer. 2017 saw the release of his first solo album, Nick Hart Sings Eight English Folk Songs, and the follow-up is due for release soon. Tickets for the event are available from Melanie’s Kitchen or online from www.downendfolkclub.co.uk. They are priced at £12 each in advance (£10 for members), or £14 on the door. For further information, email downendfolkclub@live.com.